Four contestants of the on-going Season 2 of Airtel The Voice Nigeria were saved by the four coaches during the second episode of the Live Show on Sunday, September 3, 2017, leaving 12 other talents up for public vote to remain in the competition. The four lucky contestants were Yimika, Wilson, Glowire and Jahtell and were saved by Patoraking, Waje, Yemi Alade and Timi Dakolo. #TeamPatoranking’s Ebube steered the first performance of the night with the rendition of Nico & Vinz’s ‘Am I wrong?’ with Annie C following with the rendition of Sade Adu’s ‘No Ordinary Love’. This was followed by Daniel, who performed Ed Sheeran’s ‘Perfect’ and Yimika wrapped up #TeamPato’s performances with Adekunle Gold’s ‘Sade’. When it was time for decision making, Patoranking saved Yimika, leaving Annie, Ebube and Daniel in need of public votes to remain in the competition. Wilson was the first to take on the stage in #TeamYemi Alade with his rendition of Mary J Blige’s ‘No Drama.’ then Oge performed a rendition of Jennifer Lopez’ ‘Love Don’t Cost a Thing,’ while the third act was Majeeka with her interpretation of Seyi Shay’s ‘YOLO’ and finally, Symeca, performing Michael Jackson’s ‘Remember the time’. However, Yemi Alade chose to save Wilson, putting Symeca, Oge and Majeeka up for possible eviction. For #TeamWaje, Obichi was the first to come on stage. She performed Beyonce’s Lemonade hit, ‘Freedom’. Arewa was up next with her rendition of Toni Braxton’s classic, ‘Un-break my heart’; Shapera took to the stage to perform SIA’s ‘She Wolf’ and J’Dess delivered the first African music of the night with the rendition of ‘Is it because I love you’ by young Nigerian rapper, Keshinro Ololade, popularly known as Lil’ Kesh. Ultimately, Waje picked Glowire. Obichi, Shapera and J’Dess fate to remain on the show now lies on public votes. Kendris was up next with Bruno Mars’s ‘24 Carat’; Idyl delivered with his take on Lucky Dube’s ‘Prisoner’ and Victor ended the Live show for Team Timi with Banky W’s ‘Jaiye Ori Mi’. But Timi could only save Jahtell and as a result, Kendris, Idyl and Victor are now up for possible eviction. Four contestants out of remaining 12 will continue in the competition through public vote while eight will be evicted from the show. The first Live Show kicked off on Sunday, August 27, 2017. 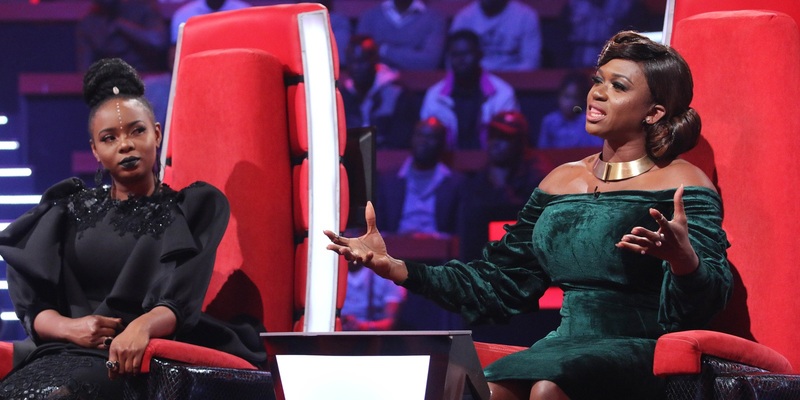 Airtel Nigeria, sponsor of The Voice Nigeria in partnership with M-Net, hosted a star-studded executive screening of the show in Lagos. The live screening, which was anchored by Ozzy Agu, had in attendance season one finalists – Patrick, Cornel, Viveeyan, Chike and Bassey who performed the popular ‘Till the World Hears Your Voice’. The night also saw comedic acts from Funny Bone and Akpororo. Viewers can watch the show every Sunday on Africa Magic Showcase (DStv Ch151) and Africa Magic Urban (DStv Ch153) by 7pm Nigerian time.